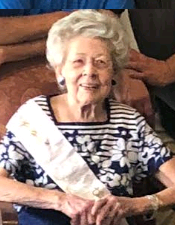 Obituary for Grace E. Hoellein | Laughlin Memorial Chapel, Inc.
Age 100, of the South Hills, on Wednesday September 12, 2018. Wife of the late Robert L. Hoellein; mother of Ron (Joyce) and Ken (Laura) ; sister of the late Ruth Harvey; grandmother of Andrew (Deidra) , Nathan (Kelly) , Timothy (Kevin Saunders) and Elizabeth (Jamel) Kyte; also survived by ten great grandchildren, nieces and nephews. Friends will be received at Laughlin Cremation & Funeral Tributes 222 Washington Road Mt. Lebanon on Friday 2-4 & 6-8 PM. Service in the Mt. Lebanon United Methodist Church 3319 West Liberty Avenue Pittsburgh, PA 15216, on Saturday at 10:00 AM. In lieu of flowers, memorial contributions may be made to Mt. Lebanon United Methodist Church for the Albright Scholarship Fund at West Virginia Wesleyan College or to the Benevolent Care Fund at Asbury Heights 700 Bower Hill Road Pittsburgh, PA 15243.